A number of downtown planning efforts are underway (as you’ll see below), but none perhaps as critical to the future of right-sizing downtown’s many bloated streets and defining the next generation of protected bikeways as this effort. 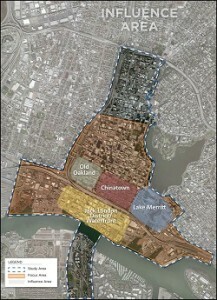 The “CCS,” as it called for short, is a coordinated effort between the City of Oakland, the Alameda County Transportation Commission (ACTC), and City of Alameda to update the assessment of local and regional circulation needs in the study area. According to the initial traffic analysis, “more than 80% of the streets in downtown Oakland have excess vehicle capacity, meaning that space on those streets could be reallocated to better serve other road users by reducing vehicle lanes and widths and creating bicycling lanes, wider sidewalks, and/or transit-only lanes.” You probably already knew this intuitively, but now there are City-supported consultants backing this assertion up with real data! There are several categories of potential recommendations for converting street space to improve downtown’s “public life,” including: Sidewalk and Parking Enhancements, Pavement to Parks, Links Across Freeways, Plaza and Park Enhancements, and Shared Streets. The baseline report includes a new “Family-Friendly Bike Network” Map prepared by the City’s Bicycle and Pedestrian Coordinator, Jason Patton, which is a draft refinement to the existing Bicycle Master Plan proposed network. Key corridors preliminary targeted for (physically protected?) bicycle upgrades include 14th Avenue, Oak and Madison streets, as well as the Telegraph Avenue protected bikeway that is in construction…although there will be opportunities to further expand and refine this network through the CCS and Downtown Oakland Specific Plan planning processes. The CCS project is planning to hold a public design charrette (collaborative working session) on Thursday, November 19th, from 9am to 4pm, followed by a community report-out meeting from 7pm-9pm. Mark your calendars, look for upcoming WOBO blog posts to help prepare, and bring your ideas to share! Grand Ave road diet goes to City Council Tuesday, October 20 for approval. Council meeting starts at 5:30pm, and Grand Ave is on the Consent Calendar as item S7.23. So it should come up quickly. While not a perfect project by far, it is a step in the right direction. Please come and support and ask for back-in angled parking and completion of the bikeway all the way to Lake Park Drive. Oakland Public Works Committee unanimously approved a road diet with bike lanes on Grand Ave, from Jean St to Mandana, as proposed by staff. Our ask for back-in angled parking, rather than pull-in as approved, was not even discussed, as there is too much concern over the novelty of it in Oakland. There was strong support from several councilmembers to see a followup project to extend the bike lanes down to Lake Park Ave, where bike lanes pick up. 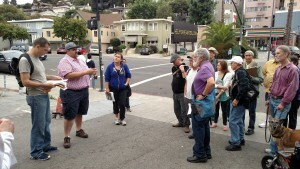 A few speakers spoke against the project, saying things like “this is not San Francisco,” “only 1% of people bike in Oakland,” and “bicyclists can’t follow the rules of the road” — the usual noise from concerned residents who struggle to imagine a better Oakland where people walk and bike around town, and local businesses thrive as a result. Council listened to their concerns but the super-majority of public support for the project allowed forward thinking and reason to prevail. We are not giving up on back-in angled parking and continuing the project toward downtown. But a followup project will most likely need to be directed by the new Department of Transportation, which is in the works but won’t be up and running until the 2nd half of 2016. We will keep you posted on new DOT developments. Send an email today to Councilmember Abel Guillen and to Project Manager Phillip Ho, and thank them for getting this phase 1 of the project moving forward and ask them when the project will be completed. 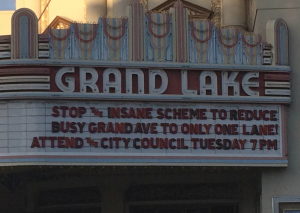 And remind them that Oakland residents want the project continued to Lake Park Ave, and want to see back-in angled parking utilized in Oakland. Good public attendance at two community workshops and a walking tour, and hundreds of emails to Oakland Public Works evidence strong support for staff’s proposal to take Grand Avenue down from 4 lanes to 3 lanes and add bike lanes north of Mandana. There is also majority support to expand the staff proposal and continue the proposed bike lanes south from Mandana to Lake Park, with many speakers supporting separated, protected bike lanes and support for back-in angle parking, as shown in the image below, but staff is simply not able to take on a much bigger project of this sort. Continue talking to your neighbors, favorite Grand Lake businesses, friends, co-workers, and family about the potential for A Better Grand Avenue! Great work everyone helping with public outreach! Please keep the pressure on by sending an email today and asking your friends to do the same. Grand Ave is one of Oakland’s great streets, and is should be a great street for walking and bicycling. Back-in/head-out diagonal parking is superior to conventional head-in/back-out diagonal parking. Both types of diagonal parking have common dimensions, but the back-in/head- out is superior for safety reasons due to better visibility when leaving. This is particularly important on busy streets or where drivers find their views blocked by large vehicles, tinted windows, etc., in adjacent vehicles in the case of head-in/back-out angled parking. In other words, drivers do not back blindly into an active traffic lane. The back-in maneuver is simpler than a parallel parking maneuver. Furthermore, with back-in/head-out parking, the open doors of the vehicle block pedestrian access to the travel lane and guide pedestrians to the sidewalk, which is a safety benefit, particularly for children. Further, back-in/head- out parking puts most cargo loading (into trunks, tailgates) on the curb, rather than in the street. Here is a report on back-in/head-out angle parking. 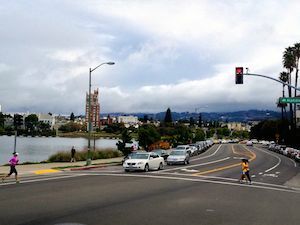 A little background: Oakland repaved Grand Avenue in summer 2014, but city leaders are now reconsidering whether there are better ways to make it safer to walk across, safer to bicycle on, easier to drive and park, and more inviting as a neighborhood main street for people to visit, hang out and spend some money. In addition, Piedmont has written into its Bicycle and Pedestrian Master Plan to reduce Grand Avenue to one through-lane in each direction and adding bike lanes. WOBO is kickstarting round 2 of the Grand Ave campaign. We have plans in the summer of 2015 to conduct deep outreach to bring the best ideas to the table for the City to consider. To learn more and or to pitch in on this campaign, contact Christopher Ulrich atChristopherU@wobo.org. Bicycling has tripled in Oakland over the past 12 years as our City has become a top 10 city nationally for the number of people bicycling. As the rate of bicycling grows, people need a safe space to ride. And an inviting space to ride is going to encourage thousands more people to try bicycling. Walk Oakland Bike Oakland supports a 4 to 3 redesign of Grand Avenue through the Grand Lake commercial district. With this redesign, there will be one through-lane in each direction, a center turn lane, bike lanes and diagonal parking. The street goes from 4 through lanes to 3 lanes (2 through and 1 center turn lane), much like the road diet on Lakeshore Avenue, shown below. Lakeshore Avenue currently, after receiving a 4 to 3 road diet in 2009 as part of Measure DD. Lakeshore Avenue carries 50% more traffic than Grand Avenue, and functions just fine. Great turnout July 8 at the Grand Avenue community workshop, with almost 80 people attending, and showing strong support for staff’s proposal to take Grand Avenue down from 4 lanes to 3 lanes and add bike lanes north of Mandan. There was also support to expand the staff proposal and continue the proposed bike lanes south from Mandana to Lake Park, with many speakers supporting separated, protected bike lanes. There was also good support for back-in angle parking, as shown in the image below. Do a road diet on Grand Ave between Fairview and Mandana, with one travel lane in each direction, a center turn lane, bike lanes, and improved pedestrian crossings with median refuge. Staff are not proposing to change anything south of Mandana because to do so would require additional traffic analysis and cost, which could delay the project. The Grand Lake community has a great opportunity to make Grand Ave a more people-friendly street, and make a statement about the type of neighborhood they want to call home and the quality of life they want for their families and the businesses of the district. 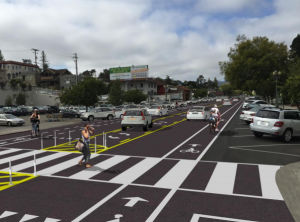 Send an email to Project Manager Phillip Ho (pho@oaklandnet.com) and cc Councilmember Abel Guillen (aguillen@oaklandnet.com), stating your support of adding bike lanes to Grand Ave and making pedestrian crossing much safer. 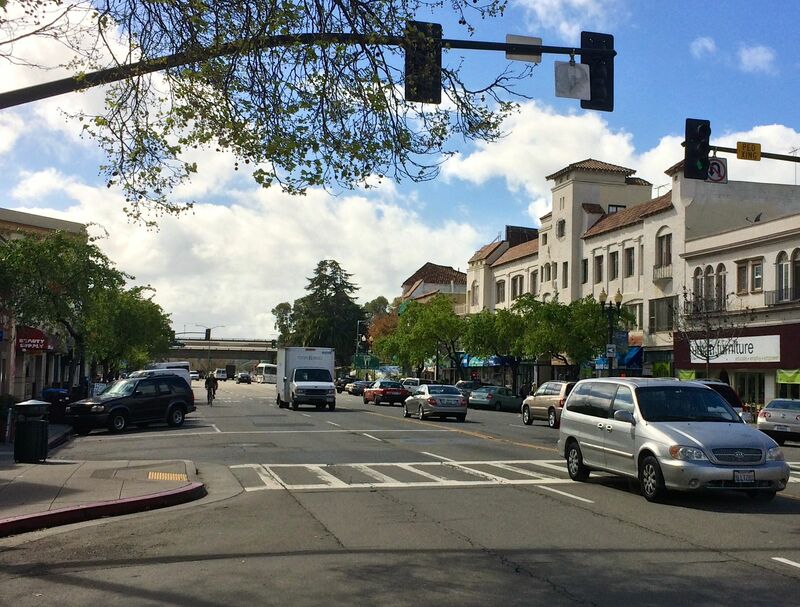 10:00-11:00 am | Meet in front of The Star on Grand, 3425 Grand Ave.As a follow-up to this week’s community meeting to review the proposed road diet for Grand Avenue between Elwood and the Piedmont border, Councilmember Guillen and City staff will lead a “walk audit” to show locations of changes in lane striping. Meet at 10:00 am for an informal hour-long walk/talk ending by 11:00 am at the Piedmont border. Clickhere for more info about this plan to increase pedestrian and bike safety, and improve traffic flow. Grand Avenue is intimidating and unpleasant for many people, especially the stretch of Grand Ave near 580. 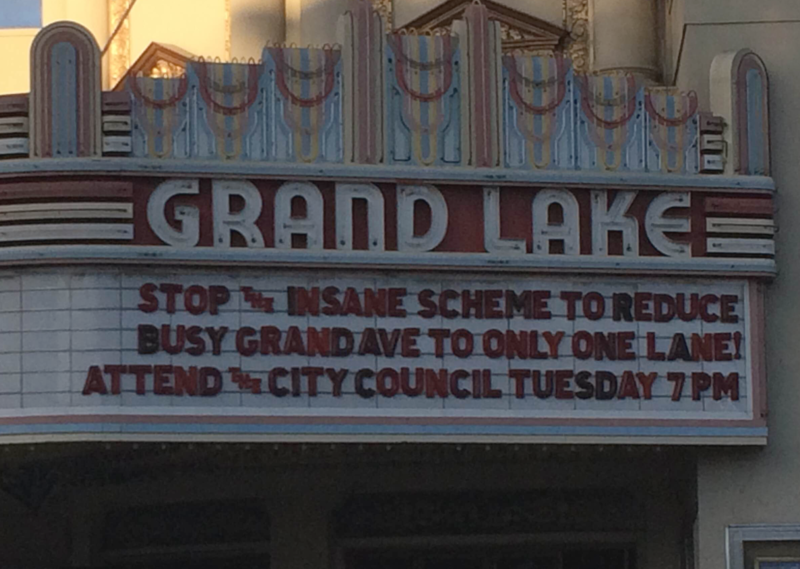 It does a poor job of connecting nearby neighborhoods with Lake Merritt and to wonderful Grand Lake businesses. To learn more and or to pitch in on this campaign, contact Christopher Ulrich at ChristopherU@wobo.org. For the past fourteen years Sal Bednarz has been living and working in Oakland’s Golden Gate neighborhood, comforted by the neighborhood feel and the unique diversity of his neighbors. He can usually be found behind the coffee bar at Actual Café, chatting up his neighbors. Bednarz opened Actual Café in 2009 and with bike friendly extras like indoor bike parking, bicycle art shows, and hosting an annual Bike To Work Day Energizer Station, Actual Café quickly became a hot spot for local cyclists to retire their pedals for a pint. Actual Café won the Bike East Bay Bike-Friendly Business Award in 2010. “This became a defining characteristic of Actual Café and has won us the support of cyclists and cycling organizations,” said Bednarz. But Actual Café is more than just a hub for cyclists. Bednarz’s main focus for the café is to serve as a meeting place for neighborhood folks, a place to get comfortable, enjoy a great bite to eat and just relax. “We are the people in your neighborhood,” boasts their Facebook page. With super friendly staff, community boards covering the walls and Laptop-free weekends and dinners, Actual Café has a true neighborhood feel. The café is always cozy and alive with community engagement, everyone talking at once, forks clanking against plates and the woosh of the espresso machine. Bednarz is on a mission to connect his neighbors, old and new to their community and to each other. He spent all day at Love Our Neighborhood Day in May doing just that. 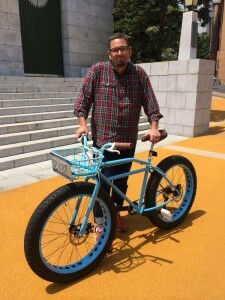 Perched on the seat of his new baby blue Japanese cruiser style bicycle, Bednarz rode up and down San Pablo shaking hands, making friends and connecting with his neighborhood. “One of my desires [for his community] is to help introduce neighbors to each other and help to create a sense of neighborhood identity that reflects all parts of the neighborhood,” said Bednarz. To help keep their bellies full and their spirits high Bednarz just opened up a new spot dubbed Victory Burger, serving up delicious affordable treats, at San Pablo and Alcatraz. Stop by Actual Café and Victory Burger and say hello to Sal, he is just dying to meet you.